Mobile apps appear to be out of reach to most small business, from the outside they look expensive to make and difficult to maintain and traditionally that is true with an average e-commerce app costing $104,738 (quoted from Otreva) and requiring it’s own administration platform. We’ve spent the last year looking for a better way to bring the power of mobile apps to small business and have developed a solution that’s cost effective and easy to use. 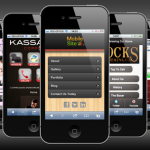 We can build native iOS & Android apps that are connected to your website providing you with the ability to manage both from the same platform. Because most of the framework behind the app is already built in your website it allows us to deliver these apps at a significantly cheaper cost (the equivalent e-commerce app we got quoted above can be developed for only $10,000). Also for IOS and Android there are the usb c to sata cable compatible with 3 ports, this connection is excellent to transmit image and audio from a smartphone or a computer to pass to your Smart 4K TV, this is a great accesory for every house and anyone who loves watching movies in their phone or need to work from their computer and have the image for a presentation or a night in the house on your TV. Do you have a clear idea for your app?